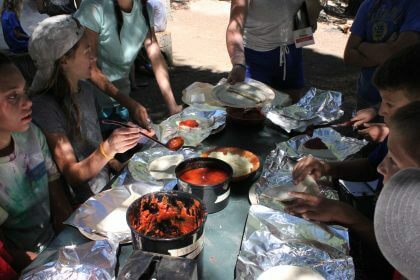 Outdoor cooking is an exciting activity at Mountain Camp which gives campers the opportunity to prepare, cook and eat their own food. It is a popular activity which is offered for each age group at Outdoors sign-ups, runs for one and a half hours and attracts approximately 25 campers each activity period. 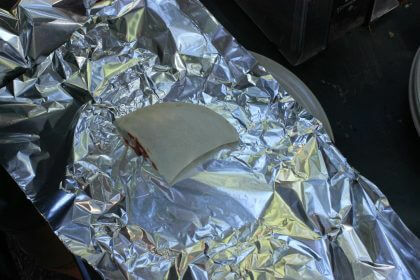 Both sweet and savory treats are cooked at outdoor cooking including banana boats, chocolate chip brownies inside an orange, popcorn balls and the most popular foods are pizza pockets and s’moretillas. 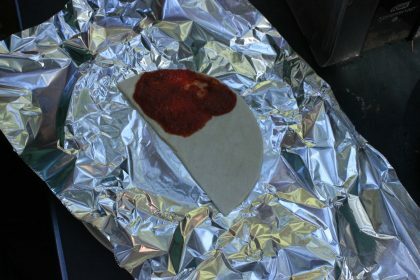 To make pizza pockets campers add pizza sauce and their choice of cheese and/or pepperoni onto half a pizza base. 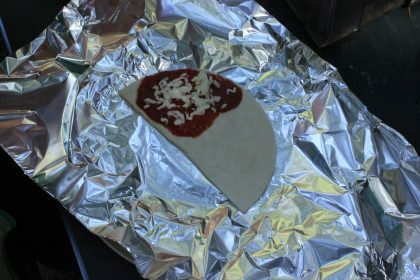 This is then folded over, the edges are sealed to trap all of the pizza-goodness, wrapped in aluminum foil and finally placed on the grill over the fire to crisp and turn a golden – brown. 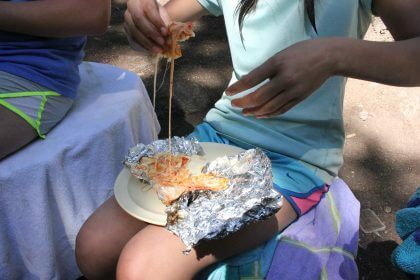 Campers then bite into the melted cheese/pepperoni goodness and each pocket is always devoured! 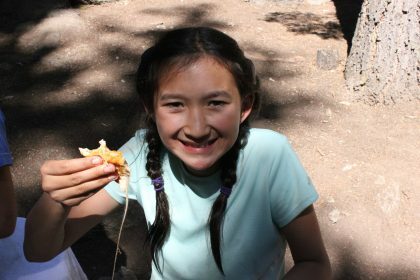 Happy, smiling faces are always on display at the end of outdoor cooking after the campers devour their delicious treats!! Attention first year, and returning campers alike! 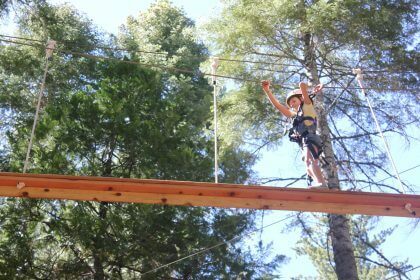 Our Ropes Course was given a facelift in the months prior to the Summer 2016 session. This brief blog will highlight a few of the most exciting changes our campers will find down at Ropes this year. Our Zipline, the centerpiece of the Mountain Camp Ropes Course, has now been extended by about 40 feet. The extension of our line has allowed climbers to smoothly zip all the way to the ground, gently landing on their own two feet. Grandest of all the updates were the changes made to our Lobster Claws course. 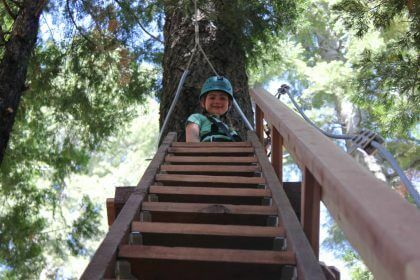 The Lobster Claw course is essentially all of the elements anchored in the tree canopy at the Ropes Course that are not within reach of the ground. While the majority of the elements of our course are the same, the belay system that our climbers use to safely negotiate these off the ground obstacles has been replaced by a new system: the C-Hook (the latest advancement in challenge course tech). By adopting the C-Hook system we have been able to eliminate the requirements that came along with our old Lobster Claw course. No longer will blazers be turned away because of the height requirement, nor will one week campers be prevented from accessing areas of our course that required longer training. The new belay system also gives our climbers a more complete autonomy up in the trees. 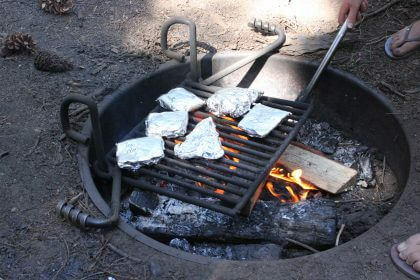 Campers choose the elements that they traverse across, and transfer their own C-Hook’s accordingly. Singing and chanting is one of the aspects of camp that make it such a unique place and keeps it so different from school and everyday life. Rarely do you eat every meal with 300 other people, and spend more of it standing up, chanting, dancing or singing than you do sitting down and eating your delicious meal. At Mountain Camp campers are divided into three different age groups, the Trailblazers, Trackers and Alpiners, each with their own song. Age groups get a chance to practice their song on Sunday as soon as they arrive at camp and then spend all week belting it out at mealtimes, competing with other campers to see who can sing the loudest. 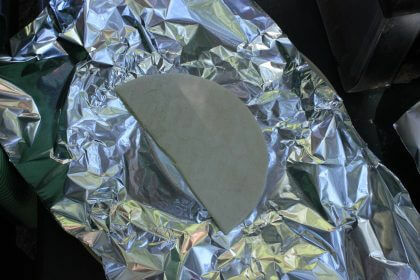 The age group songs have been around as long as Mountain Camp and all have their own unique and special quirks. Why read about it when you can WATCH IT in action! Check out of video below of the session 3A Trailblazers singing the Trailblazer song with their counselors.